This week on Foodista we are sharing easy slow cooker soup recipes to help you get through the busiest of weeks. 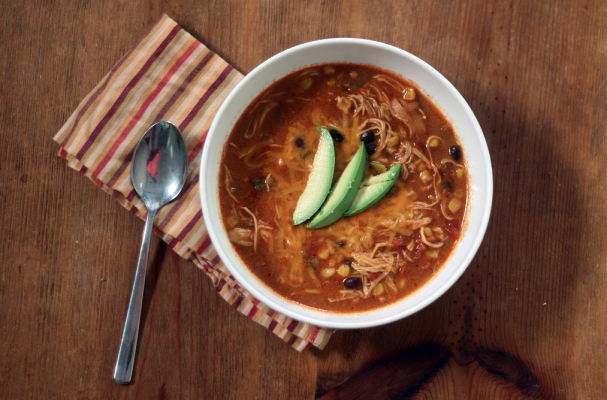 Chicken enchilada soup only requires 10 minutes of prep time and then it's smooth sailing from there. Aside from searing the chicken breasts and thighs, the rest of the cooking is done in the crock pot. This meal is lighter than traditional enchiladas and naturally gluten-free. If you are into making meals ahead of time, this soup can last in the fridge for up to 5 days or kept in the freezer for up to 3 months. This warm and comforting soup is best served on a cool fall evening. If you missed yesterday's slow cooker potato and corn chowder, click here for the recipe. Heat a skillet over medium high heat, place a tablespoon or two of oil in the pan, just enough to coat the bottom. Season the chicken breasts and thighs with salt and pepper. Sear the chicken for 3 to 5 minutes and then flip to the other side. Cook another few minutes. Remove the chicken from the pan and let rest while you prepare the other ingredients. Add all the chicken stock, enchilada sauce, tomatoes, corn, black beans, green chiles, garlic, onion and cumin to a slow cooker and stir to combine. Season with salt and pepper. Add the chicken to the slow cooker and cook the soup for 3-4 hours on high heat or 6-8 hours on low heat, until the chicken is cooked through and shreds easily. Use two forks to shred the chicken. Stir in the freshly chopped cilantro just before serving. Serve with avocado, cheese, sour cream and tortilla chips.